No girl really means that. You most definitely should send flowers. And technology makes it so easy to do online at DaFlores.com. Just click the country from our long list of destinations. We send to over 4,000 cities across the Americas, Europe and Asia. My heart goes out to all the couples in long-distance relationships. If absence makes the heart grow fonder, then distance makes the heart ache with longing. Flowers defy the distance between lovers. Our florists work only with buds snipped that very morning and DaFlores offers same-day international delivery. That freshness erases your separation by 10 time zones. You couldn’t look as perky as those flowers after a trans-oceanic flight. A rose wordlessly expresses the feelings you can’t communicate with caresses. Hugging a bouquet is almost as good as embracing your beau, and you can accompany the order with a plush teddy bear to squeeze at night. An arrangement sends messages of love, tenderness, and hope to share each other’s beauty in person soon. Ladies, don’t leave Valentine’s Day gestures all to the men. Inhaling the aroma of flowers will remind him of your scent. Send your sweetie a vase to fill the room with fragrance in your absence. 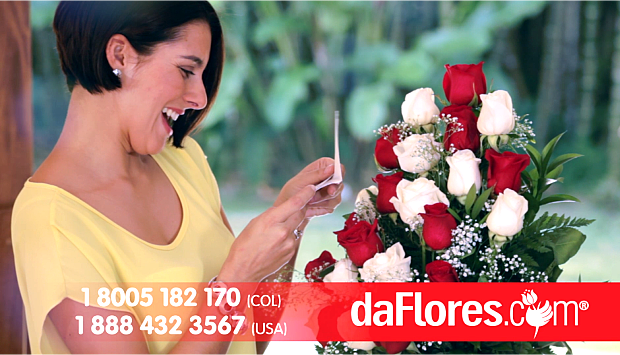 Select from the popular arrangements DaFlores has prepared for Valentine’s Day, from the classic dozen red roses with a box of chocolates to colorful pink and yellow combinations. A sentimental delivery to the doorstep of your special someone is just a credit card order away (so much easier and cheaper than buying a plane ticket!). Let daFlores.com show up in person with a bunch of love in their hands on February 14th. We’ll leave the virtual part up to you two.